It became obvious by the size of the hole kept expanding that they were doing more than just pulling out the underground petroleum holding tanks. 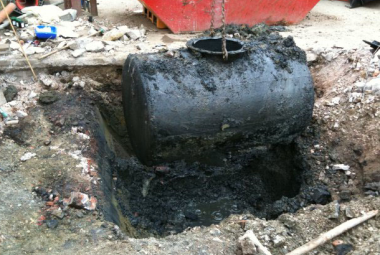 The remediation process to remove hydrocarbons from soil due to leaking tanks can sometime be a lengthy one. The contaminated soil has to be transported to a site approved by The Ministry of Environment. It is necessary to dig away a portion of the soil and complete a chemical test of the remaining site to determine if any hydrocarbons remain. This process is repeated several times until all of the contaminated soil has been removed. By the time they were complete the hole was 30 feet deep! When a hole is about three storeys below grade and you see a groundwater barrier being installed immediately adjacent the public roadway you know that contamination extends into that road. I am told in Saskatoon the groundwater will typically flow in the direction that our Saskatchewan River can be found. In this case that would mean it is highly probable that the hydrocarbons extend into the road and onto single family residential which is located directly across the street from this old gas station. I sold a motel which was located on a main arterial street in Saskatoon about 15 years ago. A Phase II assessment revealed contaminated soil at the front of the site. Again, we encountered a situation where the contamination did not stop at the property line but extended under the roadway. There are many examples of contaminated roadways in this city. Here’s another interesting one. It was discovered that an old fuel tank which supplied a back-up generator had been buried under an 11 storey apartment block. When we discovered that tank had leaked and left the soil under the apartment contaminated. I was sure my sale was dead! A financial institution will not lend money unless the Ministry of Environment has stated that the site meets their standard. Because at that time there was no technology available to remediate the affected area the Ministry approved the site. My client was able to secure financing and complete the sale. Why is it necessary for a commercial property owner to remediate their site but the City is required to do nothing? The single family homeowners of the property mentioned above may never know that they are living on contaminated soil. There is no requirement to obtain an environmental assessment when purchasing one or two unit dwellings. What is a potential long term solution? Bioremediation involves the use of either naturally occurring or deliberately introduced microorganisms or other forms of life to consume and break down environmental pollutants, in order to clean up a polluted site. I have found a credible local engineering firm that is experienced in this newer science and am working with them on two different properties to determine its effectiveness. I understand the huge disruption that would be caused if cities were required to remediate public property. The bioremediation injection process is far less intrusive and far less expensive than the old “dig and dump” method. If you own contaminated property that is currently not saleable, give me a call. There may be a feasible solution available to you that will recover that lost equity.